Every year, the Bronx EdTech Showcase brings together some of the borough’s leading innovators in advancing how technology is taught on CUNY campuses. The fifth annual showcase will be held this year at Bronx Community College (BCC) on Friday, April 28. Lehman College will be represented by four educators who will be sharing their insight and work. 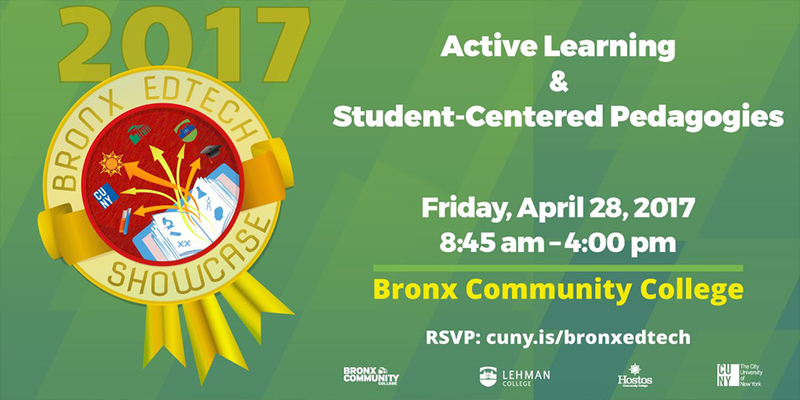 The theme of this year’s conference is “Active Learning & Student Centered Pedagogies.” The showcase is a joint annual collaboration of Lehman, BCC, and Hostos College. Lehman hosted the event in 2016. Professor Bret Maney, an assistant professor in Lehman’s English Department, will be making a presentation at the showcase called “Building the Digital Humanities Classroom: English Innovations in Multimodal Teaching and Learning.” Maney will discuss the design, funding, and implementation of the English Department’s new Multimodal Learning Lab, an interactive digital learning environment. The lab is a state-of-the-art networked smart classroom that offers retractable virtual desktops, a sophisticated short-throw projector, interactive whiteboard, and presenter’s podium. Presenting with Maney will be Professor Paula Loscocco, chair of the English Department; Deirdre O’Boy, lecturer and assistant chair, English Department; and Jennifer Martinez, IT assistant, English Department. The third showcase from a Lehman educator comes from Frank Mercogliano, an adjunct instructor in the Sociology Department, who will be presenting the “Effects of Student Learning by Utilizing Hybrid Methodologies.” Mercogliano will discuss the efficacy of using video presentations accompanied by power point notes in student learning. Castellano says that Lehman has been at the technology forefront of CUNY schools since 2014, with its integration of technology into the classroom, and use of BlackBoard. BlackBoard is a virtual learning and course management system, used to add online elements to classes and develop entire online courses. The event will be held between 8:45 a.m. and 4 p.m. at BCC’s North Hall Library.